A hearty salad brimming with South-East Asian flavours. 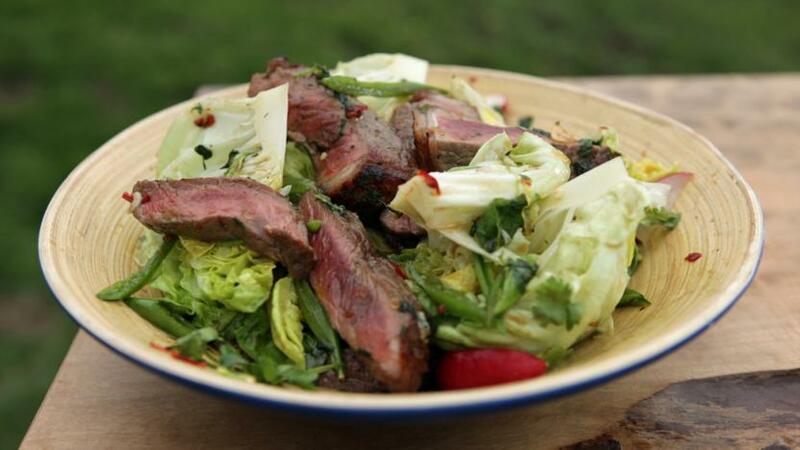 Great as a lighter barbecue dish or a quick supper. Each serving provides 338kcal, 37g protein, 11g carbohydrate (of which 12g sugars), 16g fat (of which 4g saturates), 1g fibre and 2g salt. Preheat a barbecue or griddle pan to hot. Season the steak with lots of black pepper, drizzle with oil and place onto a hot barbecue or griddle pan for five minutes, turning half-way through. To make the dressing, put the chilli, palm sugar, garlic and a teaspoon of salt into a pestle and mortar. Grind for 1-2 minutes, then add the coriander and mint and grind for another minute. Mix in the fish sauce, soy sauce, lime juice and zest. Cut the lettuce into six wedges and place in a bowl. Top with the sugar-snap peas, radishes and a few coriander leaves. Pour the dressing over the salad and toss to coat. Slice the beef and lay it on top of the salad.